The interest in A Simple Visual History of Digital Transformation prompted some to ask about where do we go next. Make any predictions on digital transformation and you can be sure that someone is currently working to undermine your credibility. The following suggestions for the future of digital transformation are offered on the basis that these are ideas that exist “but are not yet widely distributed” to borrow an idea of William Gibson. As the costs of digital connectivity and computing power fall, these capabilities are being added to more and more devices. The internet of things has reached our homes and our workplaces. The increased ability to gather and use information in real time will drive new innovations in our businesses and our lives. Add enough digital connectivity and computing power and you have created the potential for a mesh of sensors, connectivity and processing power to fill our environments. Now our digital things and our communication devices can be in constant contact and new applications will be developed to take advantage of the rich digital environment. The digital mesh will help accelerate digital automation as many traditional roles of knowledge workers, such as the gathering, digesting and processing of information now flow from an ambient mesh and are managed through algorithms and their managers. 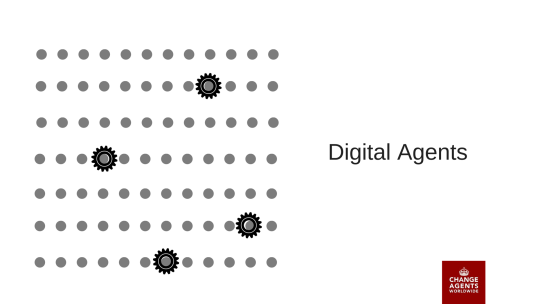 A digital mess also enables the greater leverage of bots, digital agents that can navigate the mesh and achieve outcomes for their owners, clients and masters. These algorithms take on the role of making local decisions or acting as advisers or facilitators across the breadth of the networks. 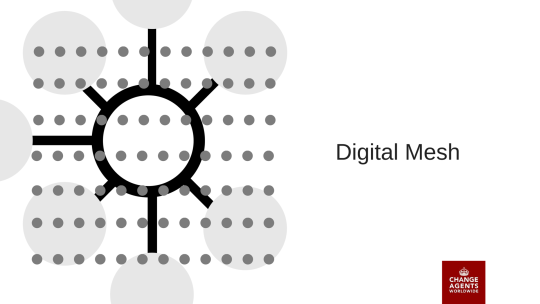 Digital Agents help manage the scale of information and the real time demands of the mesh. Distributed and connected computing power also enables us to revisit concepts of how we record, store and share information on concepts like ownership, identity and history of transactions. Instead of a single ledger located in one location, the transaction history can be distributed and validated across the network, as in blockchain. Innovations will build on these capabilities into new domains. 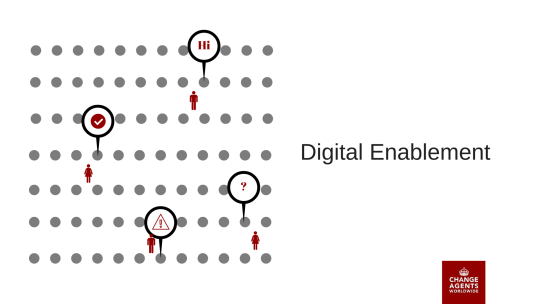 The digital mesh increasing can enable individuals by supplying capabilities need for individuals to have greater awareness, connection or to do work that was previously beyond the capability of a single individual. If an organisation is a solution to transaction costs as Coase suggest, there are new implications for the role and future of our organisations and the growing capabilities of the digital systems will shape the work individuals will do (or don’t do). We have not yet begun to explore the potential of extending this digital mesh and its capabilities to the entire world. We can already see new approaches, such using e-commerce villages in China, video in education in India, market pricing data for farmers in the third world or mobile payments in Africa. As the costs of digital technologies fall and reach expands new entrepreneurs will solve new problems for those beyond the reach of this technology today. Perhaps then we will truly experience the power of the Internet of Humanity. Since the Mosaic Browser helped introduce the internet to the world, we have experienced a digital transformation of business. 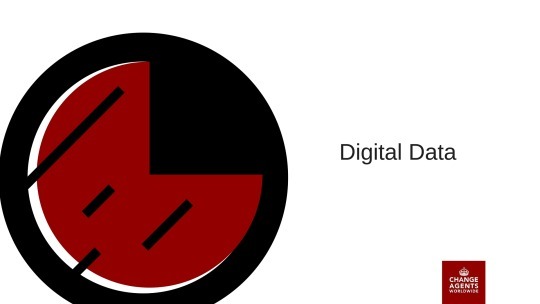 We had digital activities in our organisations before. We had already spend almost 50 years computerising processes. However, the digital connectivity of the internet began more radical change. Here’s an overly simple graphical reminder of elements of that journey. 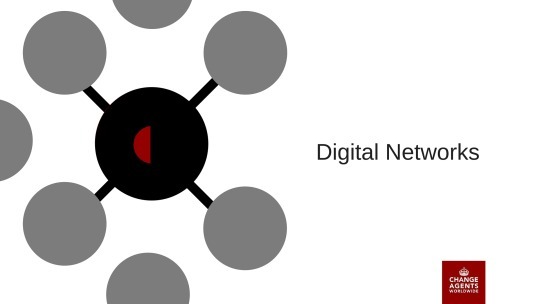 We began by creating digital channels to connect our organisations to their customers. The website began with simple digital brochures and basic contact information. Very quickly our websites became richer and more valuable. Innovation began outside the organisation that showed the way for all subsequent phases of digital transformation. We added processes to support the customer interactions. In many cases these processes were new, partial and designed solely to support the new digital channels. 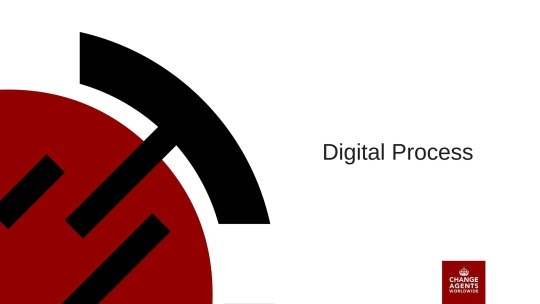 We saw potential in these digital processes and started to apply them more widely. These processes worked in the midst of our legacy process and often in unconnected ways. 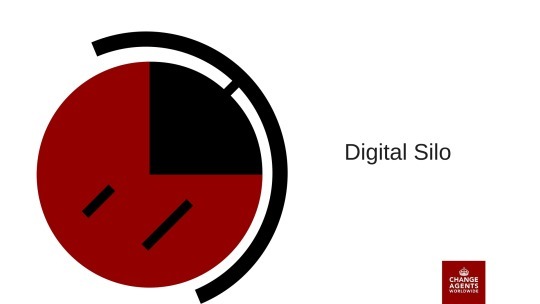 As the breadth of our digital channels expanded and we needed to manage new social and mobile channel needs, we needed a dedicated digital team to manage the expanding offering and to help integrate the core digital processes and infrastructure required to support growing digital ambitions. 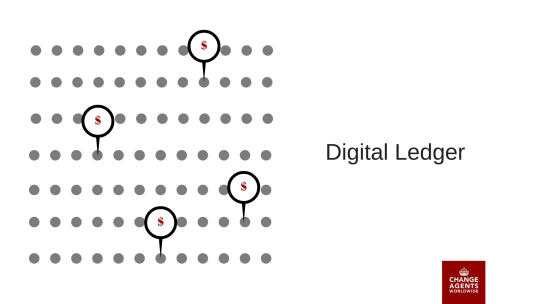 With a digital team to advocate and lead the way on growing digital opportunities, we saw digital interaction takeover much of the electronic communication in the organisation and new integrated digital processes develop in supply chains, shareholder & community management and other forms of stakeholder engagement. APIs began to standardise digital communication formats in an increasing way for organisations. Organisations could leverage vast amounts of data on interactions and increasingly on activity across the organisation. 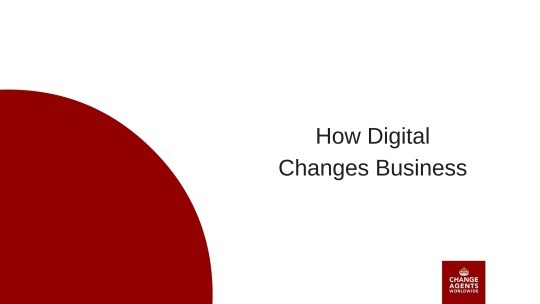 With digital interactions dominating & pressure to focus on core business activities, organisations began to become more aware that they operated in digital networks, connected to customers, suppliers and other stakeholders. Importantly, it became increasingly obvious that these networks connected all stakeholders reducing transaction costs and increasing transparency. Most dangerously these networks & data flows gave competitive advantage to those most able to leverage digital technologies in disruptive ways. 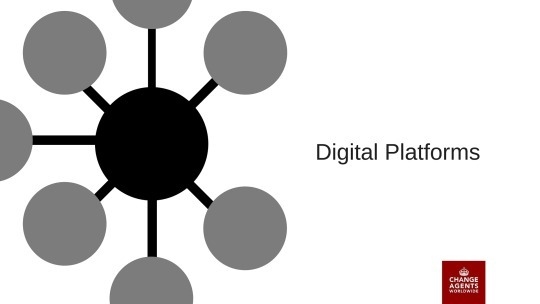 Seeing potential in connectivity, new and existing organisations saw the ability to focus on platforms that connected system players, creating new value and disrupting the traditional business of intermediaries. These platforms were increasingly agnostic of whether they ran on a computer, a phone or another device, giving them greater geographic and temporal reach. We began to connect all processes & devices into networks to leverage the power of information. 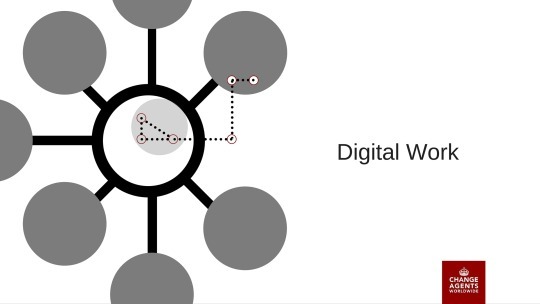 Concepts like employee, contractor, supplier and customer had less secure meaning in a networked world as chains of connectivity ran in all directions & right through the organisation. 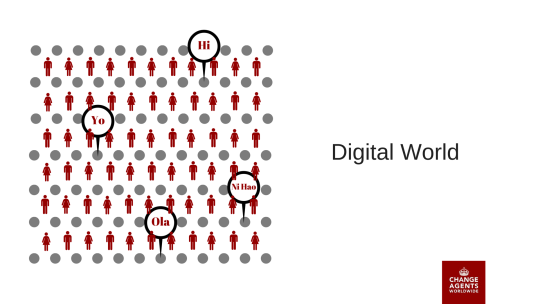 With platforms and networks running through and beyond the organisation, people began to explore the opportunities in new ways of working using digital. The boundaries of organisations no longer constrained the boundaries of work. Seeking to retain talent, leverage information more effectively and create greater agility, organisations experimented with new digital ways of working and organising work. This digital transformation has only just begun. There are many more phases ahead. The innovations and experiments of organisations will take us even further into exploring the potential of globally connected digital networks. What Kind of Community Do You Have? Enterprise Social Networks reflect the organisation’s culture and the maturity of collaboration in that organisation. As collaboration matures, different modes of engagement arise. Higher levels of engagement aligned to the strategic objectives of the organisation are fundamental to the growing value of collaboration for any organisation. Many organisations don’t create much community in their networks. Networks or collaboration features imposed without thought or support will often languish. Without clear strategic rationale for collaboration in the organisation, their efforts create a new directory of employees (In many cases, a directory of only those who adopt). The collaboration features are used to create a social profile for individuals and to help people find others using the knowledge of those in the network. When people are freely sharing ideas & their work, the level of engagement in the network rises. The community begins to resemble a salon. A salon can be an inspiring place filled with insightful knowledge and witty repartee. However, it can also be dominated by personalities, expertise and narrow schools of thought. 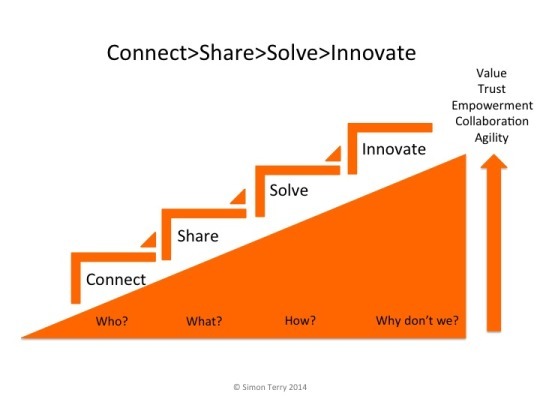 Sharing knowledge is an important step on the journey of collaboration and a foundation for greater connection but posts with links is only an entry level for the human potential of social collaboration. When trust and engagement is high enough, people will see a community as a place to solve their work and personal challenges. Like a Genius Bar, the community brings now just expertise and ideas, but solutions in the form of resources, processes and other ways to help drive change in the organisation. Well managed communities will be universal in their ability to reflecting the strategic intent of the organisation and the breadth of its people’s interests and purposes. Successful cultures of innovation are those where people have a platform to which they can take ideas for development and trial. They also leverage the value of that platform as a way to track, understand and refine new ideas and those in development. When you have an innovation platform built on a rich level of engagement of all your employees, then the value and pace of change, innovation and continuous improvement is accelerated. Where does your organisation sit today in terms of the nature of the activity in your enterprise social network or other collaboration platforms? What level of collaboration fits the culture of your organisation and its strategic goals? What are the modes of collaboration that will help your organisation best achieve the value it seeks from bringing its employees together? How have you authorised and enabled people to drive change and to collaborate in your community? How can you move your organisations network from a Directory or a Salon into more valuable levels of engagement? Do you have the leadership, community management and the change agents necessary to build trust, role model change and develop engagement? The Value Maturity Model and its supporting tools are ways to help organisations plan and execute the development of strategic value in collaboration through enterprise social networks and other communities. For more information on the Value Maturity Model and how it can help you develop collaboration, please contact Simon Terry. Yesterday I met with an organisation that wanted some of my help as they sought to solve a problem. The organisation was developing a new knowledge sharing system to enable is staff to be better informed about products and processes. There was one slight issue with this problem. The organisation already had multiple systems to enable its staff to be better informed about products and processes: intranets, social networks, training, help & support tools, automation, etc. ‘Most of the learning is peer to peer. We need to give them better options’: Why do they prefer to learn from peers who might be inaccurate or unavailable? Why will they change this if you offer a new system? ‘They won’t use a collaboration system because they say they don’t have the time’ : if time is a question of priority, why isn’t it a priority? To what extent is the culture, leadership and performance management of the team driving this lack of priority? If they won’t collaborate why will they have the time to use something else? What is there time actually spent on? What do they do instead? ‘Those system don’t give them the answers they need so we are building a new one’: If the last system didn’t understand what was required, how do you? What does relevance look like to each user? What does relevance look like to their customers? ‘They want help with process X, but we are building something innovative for all processes’: Why do they want help with that process? What’s innovative about ignoring the demand? The answers to these questions are dispersed in a wide range of people beyond the project team. They draw in questions of culture, of practice, or rational and irrational behaviour by real human beings doing real work under the daily pressures of customers and a large organisation. There’s a lot of learning to do. These aren’t parallel techniques to be applied independently. The practices of Big Learning work best as an integrated system that draws together the insights from all of these approaches to help organisations learn and work. Big Learning enables organisation to work with and through its employees to deliver change. Change does not have to be done to them. The practices of Big Learning help bring people together to share insights, learn and work as one. Today I presented a case study at Learning Assembly Australia (#learnaus) on my personal practice of working out loud. Like many such presentations, we were soon discussing the value of working out loud on the practice of working out loud. We needed the help of my #wolweek colleague, Jonathan Anthony, the master of meta when it comes to working out loud. However, there is an important reason working out loud commonly creates this experience. Working out loud fosters double loop learning. if learning is to persist, managers and employees must also look inward. They need to reflect critically on their own behavior, identify the ways they often inadvertently contribute to the organization’s problems, and then change how they act. In particular, they must learn how the very way they go about defining and solving problems can be a source of problems in its own right. When you narrate work in progress and do so visibly, you expose to others the single loop in process. Suddenly your behaviours, context, assumptions and approaches are open for review. When you begin to answer questions or respond to suggestions of others on your work, you are prompted to reflect on the approach you have chosen. This process of reflection on how you are working opens up double loop learning. Many people discover the presence of others is not even required for double loop learning to occur. The process of getting your work visible and shareable can help you to realise new and better ways of achieving your goals. This process can also cause you to reflect on your role in the wider system with whom you are about to share your work. There is nothing quite like the challenge of expressing your thoughts to straighten out your thinking. The power of double loop learning is that it can help realise breakthrough change in your personal effectiveness. By clearing the blockages, assumptions and other constraints that you have imposed on yourself, your work effectiveness increases. New avenues for learning open up. Importantly, learning accelerates because the work & the reflection accelerate. The faster you move around both single and double learning loops the greater the progress towards mastery. Working Out Loud is a reflective practice. Use it to develop your double loop learning. Working Out Loud is a practice to help ‘learn how to learn’. The purpose of this email is to explain why the last thing we need is an enterprise social network. This email is in response to the conversation about enterprise social networking in the executive leadership meeting yesterday. We thought it best to summarise the position of the leadership team, because yesterday’s conversation got derailed by anecdotes about social media, technology terminology, fear of change and discussion of abstractions like collaboration, future of work and new organisational structures. Before you left the meeting, you remarked “Based on this discussion, I think an enterprise social network is the last thing we need”. We agree. We don’t want faddish technology. We need execution of strategy. As CEO, you’ve been rightly suspicious of all this discussion of social inside the organisation. It is bad enough that your teenage children never look up from using social media on their phones. Whatever that involves, it can’t be needed activity in our organisation. We are a place of work. What made this country great was well-run organisations, hard work and increasing effectiveness in creating value for customers. That takes focused strategy, disciplined execution and a willingness to do the hard yards. Great organisations aren’t built by chasing technology whims. They come from executing strategy to create better value. When we need to create better execution on strategy, the latest fashionable technology is the last thing you need. Times are tough. Industry is more competitive than ever and change keeps increasing. We know customer and shareholder value needs to go up and costs need to come down. We have a strategy that is about meeting these new customer & stakeholder expectations, improving the organisational efficiency and delivering the returns that shareholders demand. We all wonder from time to time whether everyone in the organisation gets the imperative of the new strategy and whether they are all working hard enough to find new ways to create value. We know that we perform better when we have better conversations to make sure that our employees are aligned to the strategy. What we don’t need are distractions when there’s doubt that people even understand the strategy. When we need strategically aligned value creation, the last thing you need is an enterprise social network. To fulfil the strategy of the organisation, we know as a management team that we will have to start to work in new more effective ways. There has been too much wasteful duplication of work in the organisation. Too many of our processes & policies don’t line up across the silos, aren’t agile enough for the environment and don’t meet customer needs. Both our customers and our employees complain about how badly we do this. We need to start working in new and different ways to identify, solve and improve this on a continuing basis. We have to focus everyone on find and using better work approaches that help us to fulfil the strategy. When we need working in new and more effective ways, the last thing we need is an enterprise social network. Working in more effective ways will likely require us to change the way management works. We are going to need to push decisions down to people closer to the customer and give our people the ability to fix problems. We will need our managers to move from command and control to a coaching and enabling role. We need to ensure that all our people are realising their potential and able to work to create new sources of value. Of course in this new role, middle management will need to be trimmed and the new flatter organisation will need to change more often as we respond to further changes driven by our customers. Employees will need to step up into a leadership role in these changes and with customers, the community and the organisation. When we need to change the culture of management and asking every employee to play a bigger role in leadership, the last thing we need is an enterprise social network. Changing the culture of management is going to demand very different conversations in our organisation. We are going to have to find ways to make sure that conversations are efficient and effective. We need to leverage the contributions of more people from across the organisation. We won’t be able to rely on long meetings, workshops, speeches, video and emails. Did you see the budgets for communications, off sites & roadshows in the forecast for next year? We have to do something different. We will need to involve our people more in making decisions. If that’s going to happen our people will need to be better informed and better able to channel their contributions. Our people will need ways to inform themselves, learn by pulling what they need, share ideas of how to work better and collaborate to solve work problems. We are going to need to encourage our people to join conversations that use their capabilities to innovate, to create value for customers and create new forms of working. When you need to change the conversations, collaboration and culture of an organisation, the last thing you need is an enterprise social network. We wrapped up the last executive leadership meeting reflecting on how big these demands will be on our people. We will be asking for a lot of change in them, their work and the way the organisation exists around them. We will be asking our people to play an increasing role in the success of the organisation. We will want them to lead new conversations to create the future for this organisation. We need our people to be more engaged because we will need much more from our people. If you are surprised by point 6, think back through the needs again. After all you were the first to say that an enterprise social network is the last thing we need. We don’t want an enterprise social network because it is new technology or because it is good for some abstract goal. We need one to help our people to execute on the changes necessary to achieve the goals of our strategy. Enterprise technology only makes sense when it enables us to work in new ways that deliver strategic value. As your management team we can see that the value creation opportunity is compelling. We couldn’t see it when you made your remark, but we have come around to your perspective. The paperwork required by our old process is already on your desk, but a number of our people have started experimenting with solutions to see what value we can create. (Interestingly, their first suggestion is a better procurement process.) When you get back from the board, your assistant will show you how to log-in and join us discussing how we implement in the new enterprise social network. Thanks for challenging us to come up with a better way of working. Please think of the environment and don’t print this email. We’d encourage you to discuss it on our new enterprise social network instead.